Home » Community • School » Fraser wins for the first time in 10 years! Fraser wins for the first time in 10 years! Costa and Ivy discuss environmental issues and plant selection! It was a foggy start for the Rainbow Beach State School sports carnival but the kids turned out in their house colours, blue for Cooloola and yellow for Fraser. Cooloola have won sports day for past 10 years but Fraser looked a chance to take this year’s title and at the end of the day, Fraser took home the sports trophy! 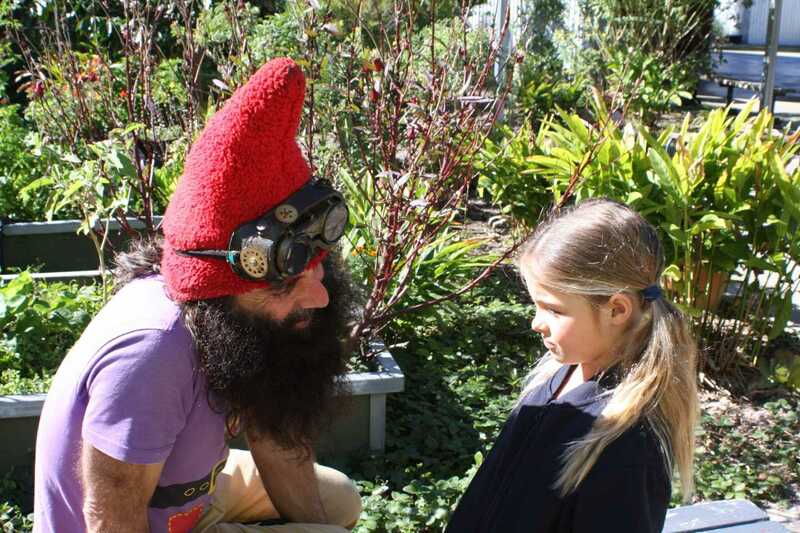 Last month, we had an impromptu visit from Gardening Guru, Costa Georgiadis. 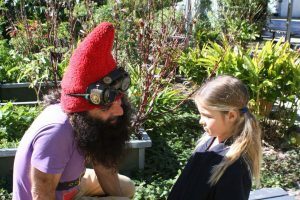 Dressed in his ABC’s, ‘Dirt Girl’ garden gnome gear, he certainly entertained the students with his spontaneous, excitable personality. I’m sure some of the students had sore necks after his visit from trying to keep their eyes on him as he jumped around from place to place! Costa discussed many environmental issues but it was his talk on individuality and sharing ideas and stories that really resonated. He absolutely loved that the 2 / 3 class had a pet tomato plant and was super enthused to share this idea with others. The school very much appreciate the $50 voucher for Wallu Nursery, generously donated to the school by Costa, his Aunt Debbie and Uncle Jim George from Sailability Tin Can Bay. RBSS P&C annual Trivia Night is on September 21. Rainbow Beach Progress Association Inc.